Temporarily relieves minor pain associated with: arthritis, simple backache, bursitis, tendonitis, muscle strains, muscle sprains, bruises, cramps. 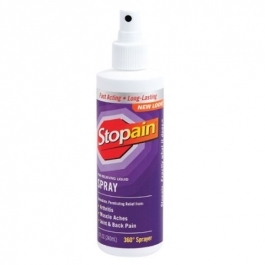 Stopain is a pain relieving spray ideal for arthritis, muscle, joint and back pain. Unlike messy ointments and creams, Stopain's clear non-greasy formula is self-penetrating so you don't need to rub. And it dries quickly with no lingering odor. Stopain is recommended by pharmacists, physicians and their patients. Fast acting. Sprays at any angle. Penetrates deep. No need to rub. Non-greasy. Pleasant scent. Adults and children over 12 years: Spray directly onto affected area without the need to rub, massage or bandage. Repeat as necessary but do not apply more than 4 times daily. Children 12 years or younger: Ask a doctor. For external use only. When using this product: use only as directed; do not bandage tightly or use a heating pad; avoid contact with eyes and mucous membranes; do not apply to wounds or damaged skin. Stop use and ask a doctor if: condition worsens or if symptoms persist for more than 7 days or clear up and occur again within a few days; redness is present; irritation develops. If pregnant or breast-feeding, ask a health professional before use. Keep out of reach of children. In case of accidental ingestion, get medical help or contact a Poison Control Center right away. Flammable. Do not use near flame. Store at room temperature.